Fewer than 10% of consumers believe that coconut, soy, almond, cashew and rice milks contain cow’s milk. On Thursday, the comment period closed for the U.S. Food & Drug Administration's consideration of a proposal “to provide greater clarity on appropriate labeling of plant-based alternatives” to milk and dairy products. A new survey by the International Food Information Council (IFIC) Foundation shows a low level of consumer confusion between the two. These plant-based products are sometimes packaged very similarly to conventional milk or yogurt, for example, and are often sold in the dairy section of grocery stores. However, these plant-based products may not be satisfactory substitutes for all uses of dairy, and some may not be nutritionally equivalent, FDA Commissioner Scott Gottlieb said in a statement requesting comment on the use of dairy names for plant-based substitutes. About three-quarters of Americans understand that plant-based “milk” products do not actually contain cow’s milk (75% for soy milk and almond milk, 74% for coconut milk, 73% for rice milk and 72% for cashew milk). 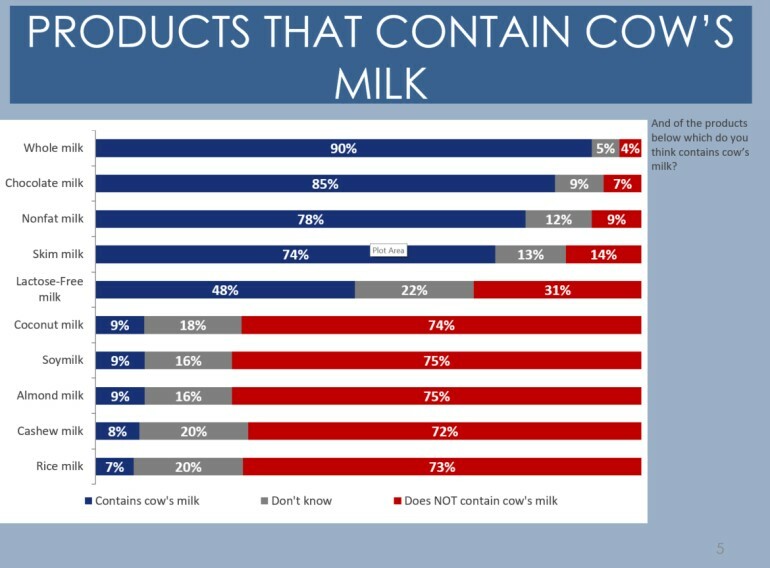 Fewer than 10% believe that any of those products contains cow’s milk, while the remainder say they don’t know (20% for cashew milk and rice milk, 18% for coconut milk and 16% for soy milk and almond milk). Consumers expressed similar awareness about whether various products labeled as milk or butter contained cow’s milk or plant-based ingredients. Cow’s milk was identified as an ingredient in chocolate milk by 84% of respondents, in organic milk by 78% and in butter by 77%, with only 8% or less believing that any of those products contains plant-based ingredients. For lactose-free milk, 62% believe it contains cow’s milk, and 14% think it has plant-based ingredients. The survey also asked about consumers’ purchases in the past three months. Nearly half (45%) bought 2% milk, 38% bought whole milk, 30% bought almond milk, 29% bought chocolate milk, 19% bought 1% milk, 16% bought both skim milk and soy milk and less than 10% bought lactose-free milk or other nut- or grain-based milks. Of those who bought products marketed as milk, 62% purchased solely dairy, while 38% purchased non-dairy products. Groups who are more likely than others to buy non-dairy products include people living in the western U.S. (45%), consumers under 45 years old (43%), people of color (48%, compared to 32% of white people) and those with a college education (44%, compared to 30% for those with no college degree).